A visit by China’s first lady last fall led to an unexpected partnership between two scientists — one in Seattle, one in Beijing — who want to create a new way to help the Asian nation’s 315 million smokers quit. When China’s first lady, Peng Liyuan, accompanied her husband, President Xi Jinping, on a trip to Seattle last fall, her visit was seen as largely ceremonial, with little expectation of serious impact. But a short conversation between Peng and a leading scientist at the Fred Hutchinson Cancer Research Center may one day lead to changes in health and culture in the nation at the center of the global tobacco epidemic. The September visit launched a new partnership between Jonathan Bricker, a Fred Hutch psychologist, and Dr. Feng Cheng, a professor of global health at Tsinghua University in Beijing, two far-flung scientists who want to curb smoking in the Asian nation, where 315 million people light up regularly — and more than 1 million die from the habit each year. 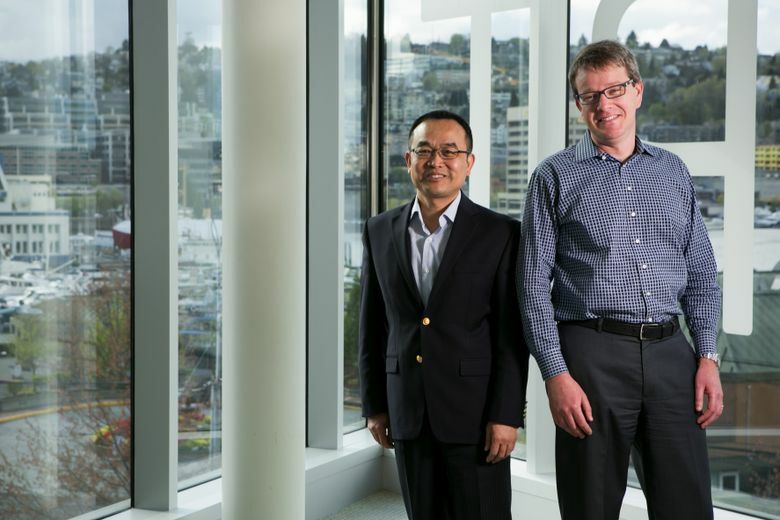 The pair are now working to develop Smart Quit China, a mobile app that could make smoking cessation widely available. Bricker spoke up during Peng’s visit in September, pitching the first lady about his clinically proven smoking-cessation app for U.S. smartphones. Studies show that using SmartQuit is two to three times more effective than trying to quit cold turkey. A similar app could help 16 millionpeople a year in China quit, he said, speaking to Peng and an audience of dignitaries that included Bill and Melinda Gates, founders of the eponymous foundation. The app uses an innovative method that provides tailored exercises and ongoing support messages to help people notice and accept smoking urges instead of trying to suppress them. “I really hope they can find a better way to quit smoking,” Peng told Bricker and the group. That short conversation, reported in news stories, drew the attention of Cheng, who has specialized in HIV/AIDS but recently turned his attention to another health threat: smoking. Cheng reached out to Bricker by email, then Skype, and there was an instant affinity, the two said. In January, Bricker traveled to Beijing. Last week, Cheng came to Seattle. The threat smoking poses in China has gained greater attention in recent years. Peng spearheaded efforts that led to last year’s law requiring all indoor public places in Beijing, the nation’s capital, to be smoke-free. That’s a move that affects more than 20 million people. But such efforts don’t begin to alter personal use in a nation where individual smokers light up about 15 cigarettes, or nearly a pack, each day, Cheng said. “Not enough people are talking about it in an urgent way,” he said. Smoking is widespread in China, affecting nearly 30 percent of the adult population. In contrast, about 17 percent of adults smoke in the U.S., or about 40 million people. “In China, they smoke while they’re driving, they smoke on mopeds, they smoke standing in line,” Bricker said. The habit is sharply skewed by gender, with about 53 percent of men smoking, compared with about 3 percent of women. The cachet that smoking had in years past in the U.S. is evident, too. Smoking is seen as sophisticated and upscale in China. Cigarettes are given as gifts and smoking is often key to social interactions, Bricker said. Despite recent hikes in cigarette taxes aimed at cutting smoking, cigarettes are still cheap, with costs ranging from less than a dollar to nearly $3 a pack, according to Expatistan.com, an online price-tracker. In the U.S., the average price of a pack is about $6, though it can be as high as $10.45 in New York. The Chinese government controls about 90 percent of tobacco production and sales, generating enough taxes and profit to account for more than 7 percent of the country’s revenue, according to the World Lung Foundation. Although the health effects of smoking are dire — including lung cancer, obstructive pulmonary disease, stroke and heart failure — they’re not as well-known in China as in the West. Doctors aren’t as well-trained in that area, Bricker said. And they don’t often encourage their patients to quit. As a result, many smokers in China have no desire to give up cigarettes, he added. “The attitudes and perceptions that smoking is dangerous are much lower there,” he said. 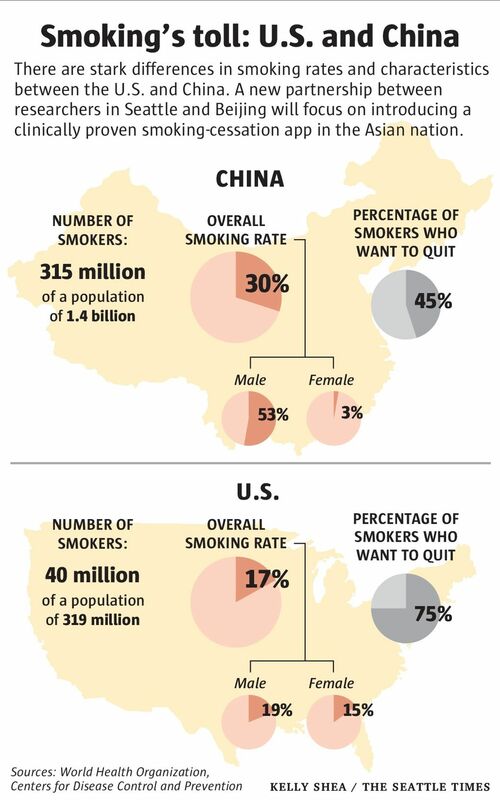 About 45 percent of smokers in China want to quit. By comparison, Bricker noted, 75 percent of U.S. smokers want to stop. Those factors combine to create significant obstacles for groups working to reduce smoking. But such an effort is vital, said Angela Pratt, who leads the World Health Organization’s tobacco-control efforts in China. Stop-smoking clinics are rare in China and medications such as nicotine patches or other drugs aren’t available because of thorny regulatory hurdles and a limited market, Bricker said. Bricker and Cheng are in the early stages of research now. Last week, they received data on the content of 66 existing stop-smoking apps available for phones in China — and found few people actually use them, or succeed when they do. Next, they’ll start considering ways to survey Chinese users about what they want in a smoking-cessation app, and how they’d use it. The answers will likely be very different from those offered by American users, Bricker said. “Something that’s scientifically proven would carry more weight” with Chinese smokers, he noted. Like the U.S. app, the Chinese version will focus on Bricker’s paradigm, called Acceptance and Commitment Therapy, or ACT, which encourages people to notice and accept the urges to smoke, with the understanding that they will disappear. The app includes eight days of specific exercises to help people become aware of their cravings, then it offers new ways to think about the urges so that people learn to notice the desire to smoke without acting on it. It’s different from other methods that simply encourage ignoring or suppressing cravings. Such a concept might catch on even more in a culture in which religions such as Buddhism often emphasize the concept of mindfulness, a gentle focus on being aware in the moment. It could take five to eight years to develop the SmartQuit China app and up to a decade before it’s widely available in China, Bricker said. He and Cheng are not being paid for their work on the project, relying on their usual incomes and volunteering their services. Finding future funding will be crucial to the project’s success, Bricker said. The Bill & Melinda Gates Foundation doesn’t have funding specifically for smoking-cessation programs now, said Cynthia Lewis, the group’s deputy director of global policy and advocacy, who leads tobacco efforts. But the Gates Foundation supports the idea of targeting smoking cessation to individuals. “We’re thrilled that it’s happening,” Lewis said. With education and access spurred by the new partnership, the demand for smoking cessation in China should increase and the numbers of smokers should go down, Bricker and Cheng said.